The Hopi tribe has crafted their own style of art and jewelry making that set them apart from all other tribes. Their unique mastery of silver and metalwork is what really distinguishes them and their pieces. They have mastered the overlay silver techniques that were taught to them by the Spanish and have continued to teach and pass down those techniques generation after generation. What we have today, is something truly stunning. 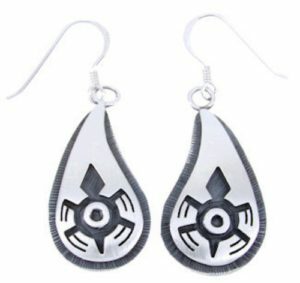 The images that frequent Hopi earrings are more clear and crisp than any other style and primarily use plain silver (no stone) in their work, making them easy to recognize. When you are looking for quality Hopi earrings, then the first thing you will notice is the use of plain silver with no accompanying stones. This is the strongest indication that the piece is Hopi and not from another tribe. The other element is a technique in silversmith work called, overlay. This process is done by using two layers of silver and tracing a design (typically an animal symbol of Hopi pattern), on a sheet of silver and then soldered onto the other sheet of silver. In this way, the piece gives a crisp contrast of the black image and the silver that is simply unrivaled. Another minor indicator is the hallmark on the back of the piece. Since the Hopi are master silversmiths, the hallmark on the back is usually a small symbol as well to indicate either the artist’s tribe name or the name of their tribe in general. When you are buying a Hopi piece, make sure that it exhibits all of the above and inspect it for quality balance, usually rounded edges or complete circles/ovals and that the pattern or symbol on the Hopi earrings or piece is distinct to that tribe, which can be searched easily.